What will Liven do with funds raised from the LVN Token Sale? 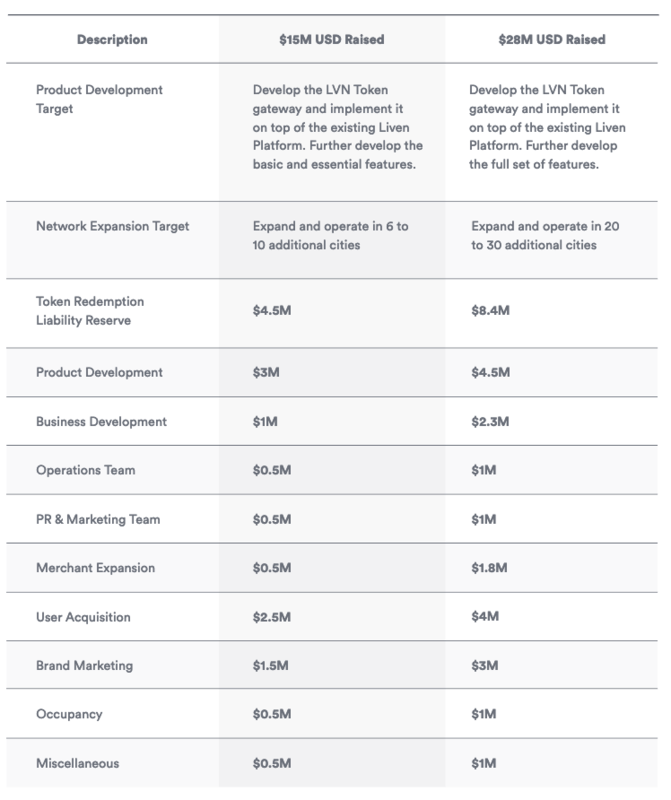 Money raised from the sale of LVN Tokens will be mainly put towards the Token Redemption Liability Reserve, Product Development, and expansion of the LivenPay ecosystem. The Token Redemption Liability Reserve serves to cover the short-term costs of reimbursing merchants in fiat currency should LVN Tokens be redeemed at the venues. The rest of the funds will be distributed across the following: the Business Development Team, Operations Team, PR & Marketing Team, Merchant Network, Expansion Costs, Direct User Acquisition Costs, General Marketing Costs, Occupancy Costs and Other Misc Costs. For full details of Use of Funds refer to the White Paper.